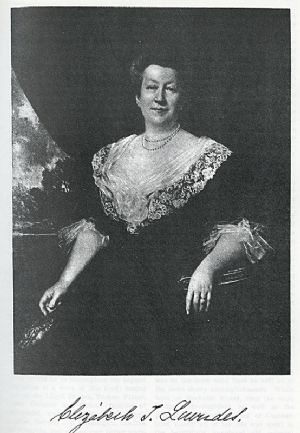 Elizabeth Tasker Lowndes, wife of Governor Lloyd Lowndes (the only Governor from Allegany County), was born in Cumberland in 1842. She was known as a gracious hostess and entertained President Benjamin Harrison and other dignitaries in her Washington Street home. Equal to her high social attainment was her spirit of charity. Mrs. Lowndes was an ardent worker in church activities, and helped to establish a tuberculosis hospital in Cumberland in 1913. The image is from Thomas, James W. and T. J. C. Williams. History of Allegany County, Maryland. [S.l.] : L.R. Titsworth & Co., 1923. Mrs Lowndes is the only woman whose portrait is included in the two volumes.